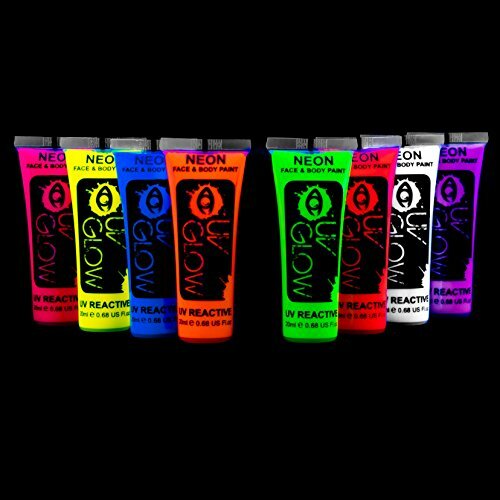 UV Glow Face & Body Paint is the original neon UV face and body paint as used by over 1 million customers worldwide. Made in the UK in ISO9001/GMP UN22716 accredited facilities. Suitable for both day and night use. This set includes 8 vivid colours. Bright, neon coloured under normal lighting, the paints give off an immense fluorescent glow under UV Lighting / Blacklights. These paints are easily applied, dry quickly on the skin and last all night. Simply wash off with water after use. Pack includes 1x Pink, Orange, Red, Yellow, Green, White, Purple and Blue. This is the larger 0.68oz size (20ml) per tube. If you have any questions about this product by UV Glow, contact us by completing and submitting the form below. If you are looking for a specif part number, please include it with your message.